Is 10GbE ready for the small office? Time to plug in to 10GbE? The 1Gbps bandwidth of Gigabit Ethernet has been the standard for business computing, in laptops and servers, for several years. But now increasing demands for bandwidth, affordable high-speed fibre connections and falling prices on 10GbE equipment are making it time to think about upgrading your wired office network. 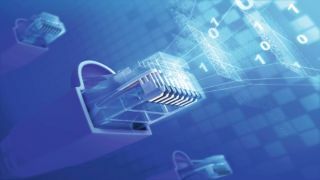 The first 10Gb Ethernet technologies used optical fibre connections, which has made them pricey to install and best suited for high bandwidth data centres and server rooms. But 10GbE over copper uses familiar Ethernet cables with RJ45 connectors, and the prices and power consumptions of 10GbE switches are falling. For example, the line of switches Netgear is launching this month will be about £85 per port rather than the £300 we've seen so far. It's part of a trend that is making it realistic for a small business to consider putting in a high speed network. Ironically, one of the drivers for getting more bandwidth on a wired network is demand for wireless connections. As more employees bring phones and tablets to work they will want to connect via Wi-Fi. The new 802.11ac Wi-Fi standard allows one access point to offer higher speed connections to devices with faster wireless and slower connections to older devices, rather than dropping the speed of all connections to the lowest common denominator. It can also combine multiple streams to offer higher bandwidth to devices that have fast wireless chipsets. When 802.11ac becomes common in devices and wireless access points, "you will see the amount of traffic going through an access point jump tenfold" predicts Perry Correll of access point supplier Xirrus. That will require a faster connection between the wireless access points and an internet connection. The roll out of BT Infinity and the latest packages from Virgin Media offer speeds of up to 80Mbps at prices within the budget of most smaller businesses (and 160Mb BT Infinity, using a fibre connection all the way into the office, is starting to become available). Although 1Gb Ethernet is faster than these high speed connections, the faster the wired network the more you will get out of your broadband because the office network won't be congested or overloaded. Employees should have a better experience using VoIP and web conferencing services like Skype and Webex with a faster wired network in the office, especially if they're using video chat or sharing their screen. Also, the popularity of cloud storage services does not actually reduce the load on the office network, because users will be syncing existing files from the cloud and uploading new ones. But the biggest driver for 10GbE in the smaller office is virtualisation and server consolidation. "When you only have one application running on a server, a couple of Ethernet ports at 1Gb is more than enough bandwidth," points out Shaun Walsh of converged network company Emulex. "But when you're running five or 10 or maybe 15 applications on a single server, you will need more." You could add extra 1Gb network cards to your server, but 10GbE is the logical next step. And if you want to do storage virtualisation, 1Gb is not fast enough. While Netgear recommends the 12-port $2,000 (£1,325) ProSAFE XS712T for storage virtualisation, for a smaller office you could use the Storage Spaces features in Windows Server 2012 with the $1,000 (£660) 8-port ProSAFE Plus XS708E switch. You need to have 10GbE in the rack as well as on the server, and the price may hold back adoption (the 24-port Netgear ProSAFE XSM7224, which has features like iSCSI targeting and is designed to sit on the top of a rack, costs $6,000 or £4,000). Another factor is that servers come with 1Gb Ethernet ports on the motherboard at no extra cost, and increasingly that's four Ethernet ports rather than just one.